Guess it's no secret I have been selling and offloading some things I don't use, need or want anymore. My Paypal balance was getting up there so I decided to just go do a little shopping. I thought I might shop next month at MQX, which has the best selection of longarm vendors anywhere. But my shopping time will probably be somewhat limited and it's easier to select pantograph patterns online. I was lucky enough to find 2 of them second-hand via MQResource, and the rest came from Willow Leaf Studio. Now, copying pantographs (aka staring at a red laser dot for hours at a time!) 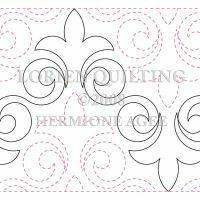 is not my favorite thing to do by a long stretch, but there are plenty of clients that request them, as well as quilts that are best off with a panto versus a custom quilting. There's a little of everything - little bit of geometric for those more male quilts, some good fluer-de-lis for a quilt coming my way next week, and others that I just liked. Maybe there is something here you'd like on a quilt! It hardly seems possible that my oldest turns nine today. I'm tryng to be cheerful and happy, but something about his birthday always makes me have a sleepless night. Or maybe it was because the house remodel is about to start. The deck is noisily being removed as I type. Either way, my son is in a most assertive and somewhat sassy phase, testing his parents and siblings rather severely right now. Too many unnecessary battles for his dominance. Sigh. I will always think back to that Friday though, nine years ago. He came home from the hospital on Easter, but was most definitely born on a Good Friday. Happy Day, my dear. . Here's another quilt made by a client. They are blocks from the Flickr Jelly Roll sampler quilt-along. The fabrics are lovely, and remind me of an Asian influence, especially the border. I loved using the clamshells and circles - just brought out the Asian feeling more. This quilt looks much different from the first one I did. 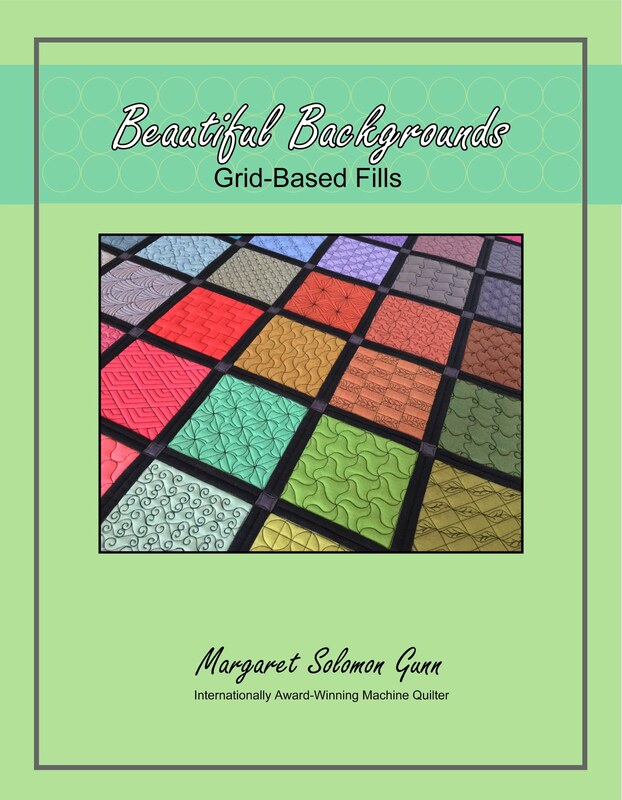 The colors and quilting style are softer, subtler. Both pretty, just so different. I like sampler quilts. They are fun to piece. Interesting to quilt. But always time-consuming because I have to think deeply about each block, and what features I wish to bring out. And one glimpse of the back, which is really a dusty grayish color. This blog is my blog. It is my avenue to vent my thoughts. I understand that these thoughts are sometimes not shared by the masses. None the less, if you don't like them, then go elsewhere, or accept that we have differences. I get it - I said something that really struck a nerve. Yes, it was unkind. I know that. I am sorry if I hurt feelings, as that was definitely not my intention. Tact is not always my strong suit. I was pretty hot and mad at the time and just needed to vent. And this has always been my venting spot. You can stop sending the anonymous hate mail. It just furthers my belief that you are a bunch of cowards. And for all of you that have no idea what this is about, ignore it. OMG, I have found yet another quilt top that was never finished. When I started my quilting business, I made up 8-10 quilt tops that I thought would be used for practice. The business took off so rapidly, that I have a couple that never actually got finished. So...this is a 65"x85" top and it is for sale. It is neatly pieced from Free Spirit fabrics of the Annabella and Treetop Fancy lines (you can tell that I loved this stuff 2 years ago!) It is hip with polka dots, sure to please any young to teenage girl. I may have backing fabric that I got at the same time which will coordinate, if interested. The top is for sale for $55 plus shipping. Paypal please. Last year sometime I started on a commisison quilt with these fabrics, at a customer's request. The client stopped her payments, and I am now stuck with a 60"x80" top that I don't really wish to finish. It is all top quality fabrics that I have ordered from good online quilt shops. Materials are from the Treetop Fancy and Annabella lines, with some Fairy Frosts thrown in too. It would finish off into a lovely quilt. And there is more...If you are interested, I have many of these fabrics that I could also sell off to you at between $4-5 per yard. This would facilitate finishing the quilt if interested. Note: I have a large backing piece assembled too that coordinates. If you want the quilt larger, more could be added to the backing. As a quilter I see many, many personalities represented in quilts. I am fairly narrow in my personal choice for quilts to make, but this job enables me to see everyone elses choices - and the designs, fabrics and styles vary tremendously. Though I may not want to make every one of the many quilts that I get to quilt, I do love seeing what people do, and getting to spend a day or so quilting them. This quilt was sent to me as a part of my penny quilting sale. The quilt is really very simple, but is nicely pieced. The mitered corners lay flat and square. This is fairly large - around 75x90. We'd initially discussed quilting meandering stars because that seemed fairly patriotic, but once I got the quilt I felt differently. The elements of the stripes relate to verses of the song America the Beautiful...amber waves of grain, fruited plains, sea to shining sea, etc. There's a row with these waving flags and another with soaring eagles and rushing ocean waves. It seemed more appropriate to quilt it with simple moving lines to represent the wind or the waves or fields of wheat blowing. In the end, I am happy with this decision and I think the client will be too. I did not do the waving lines through the center flag. This is the quilt's focal and it needs to be undisturbed. I waved through the red stripes of the flag and placed stars on the blue, and simply outlined the Statue of Liberty, which is an awesome fabric for this quilt. Where on earth did she find this??! So I know my pictures are not great, but here's a look at the many printed fabrics she chose to represent these lyrics. I love those purple mountain majesties and fruited grains. How fun is that. And there's uncle Sam hats, and some patriotic angels and I'm not sure about the people (2nd row from the outer below), but they just remind me of "We the People" from the constitution! The reed blocks were from the client's Block Lotto winnings. Gotta love that bright green. 1. Benartex Nancy Halverson Winsome, style 1252, washed and pressed. This is very nice weight quilting fabric, 45" wide, 7-3/4 yards. It is a small check of sage green on white/gray background. It is one continuous piece. $40 + shipping. 2. 4 yards of 108" fabric from http://www.sewbatik.com/. It is this fabric, same colors. Shipping (delivery confirmation and insurance extra) is $10.95 for each, or $14.95 for both. We are getting ready for a downstairs addition/renovation. Lots of things must go. 3. 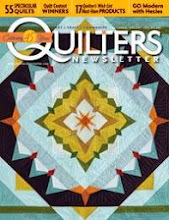 Our Best Seasonal Quilts, from Fons & Porter's magazine, paperback, 144 pages, $5 plus $3 shipping. 4. Rodale's The Quilters Ultimate Visual Guide, hardback, 285 pages, list price $29.95. I will sell for $18 plus $4.95 shipping. 5. The Joy of Quilting by Joan Hanson & Mary Hickey, paperback, 270 pages, list price $24.95. 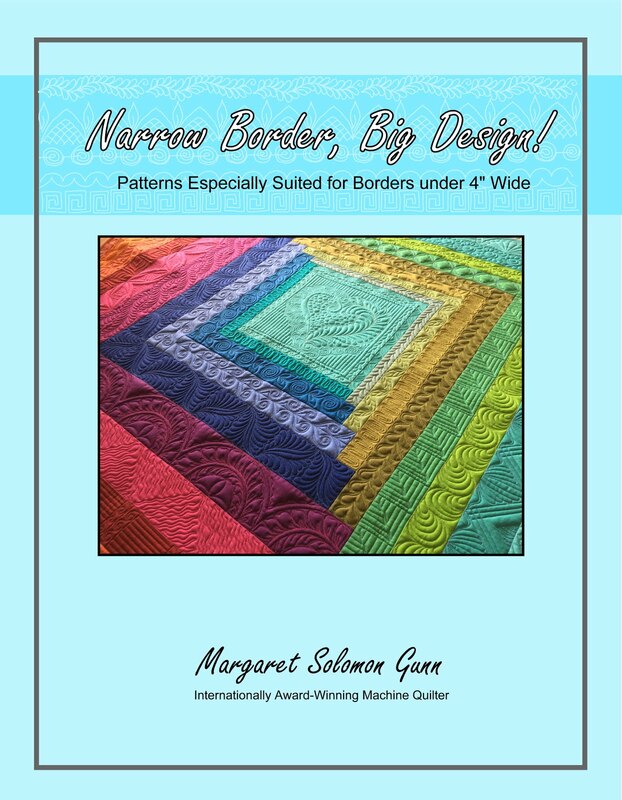 This is a great comprehensive book with sizes for many different quilts. 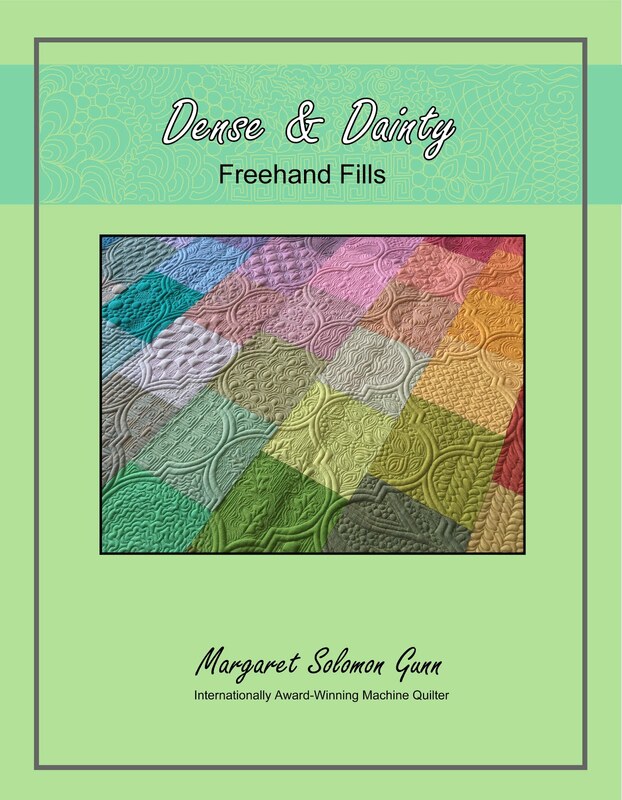 Excellent for beginner or intermediate quilter. I will sell for $16 plus $4 shipping. 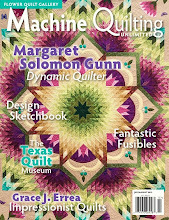 6. Leisure Arts Relax and Quilt, paperback, 144 pages, patterns for nearly 20 wonderful quilts. $8 plus $3 shipping. 8. Twosey-Foursey Quilts by Cathy Wierzbicki, paperback, 96 pages, several quilt designs using 2" and 4" units. List price $26.95, 2006 publication. $8 plus $3 shipping. Here's my thermometer display that sits on the counter. He's more than a tad confused, standing there holding his umbrella since it is a blissfully (near-summer) day outside, at a ripe 66.5F! The kids just got off of the bus all in hats and boots - pure foolishness! It's gorgeous out there. And it is mmmmmelting all of that snow. A week ago there was nearly 18" still on the yard. Now I have large masses of grass showing. It's good for my psyche. Spring just might come afterall. Here's another sneek peek at the week's quilting. This is one corner of a wall-hanging. The appliques are ditch-quilted, but I have not yet added any definition to the leaves or flowers. I'm not convinced I am adding anything to the leaves (like veins), but the flowers will get some stitching to show petals. Similarly, there are dimensional flowers that will be added to the ends of the embroidered stems. This is the center of the quilt. I think I like the design and all, but I have decided that white or light quilts are not my favorite. They show everything - good, bad or otherwise. I have 2 more corners of vines & flowers to SID, and then onto the cathedral windows to do what??? yea, something. Either way, it's off by Sunday so I can be onto other things....like removing the purple bleeding! Also, I am offloading some things I don't use anymore. If anyone is interested please email me at msolomo1@maine.rr.com. I have Ricky Tims Grand Finale DVD (120 min) for sale, $15 plus shipping $3. It's great! Tomorrow I will have a bunch of quilting books. Ok, so I am not a prewasher. And the unthinkable has happened, thankfully to one of my own quilts. I was spritzing the top to get out my quilting marks, and 2 of my many deep purple grapes bled onto the white background. Considering that I got out aqua permanent Sharpie from my Italian floor quilt, I have not really started to panic. But this is a problem. I need to do 2 things. First, get the bleed out. Then second, set the fabrics so there won't be more bleeding. I have to wet the entire quilt eventually to block it afterall. I have read about Synthropol as being good to pretreat fabrics with. It will keep the dyes suspended in water, rather than allowing them to settle into the fibers. I also read about Retayne, which would have been a good think to wash the fabrics in initially, as it sets colors. I don't want to use it now until the bleed areas are gone. I guess. All I have done so far is coat the affected areas with my Tide to Go pen. I need to pick up some color catchers. Please, if you have suggestions of what I should do please tell me and explain why your solution is the best approach. Back to prewashing...Do you prewash? Seems more and more people do not. With the advent of fat quarters, who wants to wash these small pieces of fabric that just turn into a mass of ravels?? You have made this fantastic flimsy and now it is ready to be quilted. The rest is up to the quilter, right? Well, yes generally speaking that is true. But before you get to that point in the quiltmaking process, there are many things that you as the piecer can do to ensure that your quilter has the best possible top to work with (and hence, make you the best possible looking quilt!). Thinking about how it will be quilted as it is designed and made will help. My list naturally begins with fabrics. There are a plethora of fabrics to choose from, and a tremendous range of weights/thicknesses of fabrics too. You will find the junkier, stiffer "chain-store" (or Walmart) fabrics, which I'd say as a general rule to just avoid. They'll never be soft and snuggly. When piecing, select what you like, but try to keep them all of a similar weight. The weight of the fabrics (or the fabric sandwich) affects how the quilter will tension his or her machine. If the weight of the sandwich varies, you very well may see a tension change as the stitching passes over lighter and heavier patches. Plus, varying weights of fabric will wear differently. When piecing with white, buy the absolute best quality white you can rationalize. You can always make slight sacrifices elsewhere, but if you select a thinner, lower grade white, it will be the first thing you will see on the finished quilt. Thin whites show anything underneath them, including rogue threads from neighboring seams. I like the Moda Bella and Kona whites. Still, however, when using a white of any kind, try your best to press all seams AWAY from the white fabric. I would even go so far as to suggest not making quilts that have a lot of white with other deep colors such as red, navy or another deep color. They will show through the top somewhere, and are so very prone to bleeding onto the white. Use a thread that either matches your fabrics or is of similar tone. Lights are usually fine with a white or pale gray. Darker fabrics need a darker thread. Once the quilter gently tensions your top, any white threads will definitely show. Use a lighter weight thread, like a 50 wt. I hate when I see a quilt all pieced with 40wt hand quilting thread. It leaves a most visible line in the seam. Use a reasonably short stitch length too. On my digital machine, I sew with a 1.8. The shorter stitch length does a couple things. If you are not prone to backstitching at the end of a seam, the tighter stitches will not pull out as easily. Also, the tighter stitches will hold the seam nicer when it is tensioned for quilting (less likelihood of seeing those stitches if they are not a perfect thread color match!). I have actually started piecing with my 50wt (60wt in bobbin) polyester longarm quilting thread, but you can find a nice fine thread. 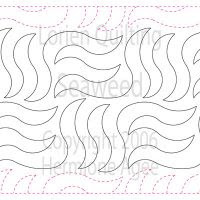 The tension of your piecing thread should be properly adjusted so that you don't have those little ticks along the seam. Don't assume that because it is inside of the quilt that it will be just fine. An ill-tensioned seam will pull open and show the threads (often in an unmatched color!) when tensioned. Plus, that seam is much more likely to come open at the ends. We all know about the sacred 1/4" seam, but too many people still have their version of what 1/4" really is. In actuality, it does not really matter if you sew at 3/8" or 5/8" as long as you are consistent throughout your top. Where problems creep in is when there is a 3/8" seam somewhere, some 1/4" seams and that dreaded 1/16th inch. First off, inconsistent seam allowances create non-flat and non-square blocks, that very likely have poor matching of points. Secondly, if there is a very narrow seam allowance, it creates a weak area that may well pull open when the quilter puts the quilt onto the frame. So, just be careful here. Yea, I mean with an iron. And if you find that a seam flip-flops, then kindly do the noble thing. Rip out a few stitches, move it to the direction it should lay, and restitch. In the end, you will have a much nicer quilt, that will lay flat where it ought to be flat. Any piecing on the outside of the quit top's periphery should be either be backstitched, or have a row of stay stitching across. There's nothing that chaps me more than to load someone's quilt and have the outer border start pulling apart before it is even quilted. This step takes very little time too. 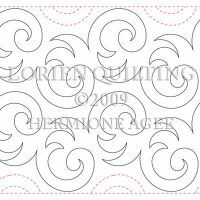 Many people need to go back to "Borders 101" and revisit how to add borders of the proper length (see the internet for hints here...but generally speaking, measure quilt at center, and cut border this length, pin and sew on). If you improperly add your borders you run the risk of having borders that will have too much fabric, and will require the quilter to take what can sometimes be an unsightly tuck or tucks in the border (in addition to pulling out her own hair). Some quilters go to the extent of removing a client's borders and restitching them properly (at the client's cost). I don't go this far. Additionally, I commend those of you that do mitered corners on your borders. They are classy. But do check that the corner lays squarely (use a 12"x12" square). If you are piecing blocks, take the time to square them all up before they are sashed. This will help you to make a squarer quilt. This is especially important if you are placing your blocks on point. Somehow the on-point setting distorts small anomalies more. Envision this: Your top is attached to a roller and then pinned to another parallel roller. 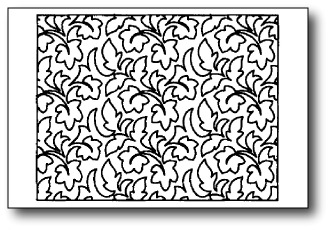 If it is not square, then it cannot possibly lay smoothely where it is supposed to be quilted. Your quilter will curse a bit, use lots of pins to help make it lay down, etc. It makes the process of quilting much harder, and you run the risk that your finished quilt is not as pretty. One last thing about piecing (only because this eventually affects the squareness of a top) - For those on-point quilts that require setting triangles, keep the outer edges always ON GRAIN! No quilter wants to see a quilt that has bias edges on the outer edges of a quilt. I'm sure you can imagine how hard it would be to quilt a bra and make it look like a square, so keep those blocks and tops flat. Sure, your quilter can quilt anything down, but it won't look like anything you will want to pay for. I saw a recent YouTube video by Sharon Shaumber (may be misspelled) about using spray starch to shrink blocks if they have too much cleavage. Might want to check this out. This list of helpful hints is brief. Keep them on-grain. Keep all selvages out of seams, as they will pucker. Press those seams open. Leave the recommended amount of additional backing fabric that your quilter requests (yes the back must be several inches larger than the top). The back must be square. There are many other personal considerations for backings, but from a technical standpoint, they are of lesser importance. I prefer not to see busy fabrics on the back when a custom quilting is desired. Similarly, I don't care for heavily pieced (aka double-sided) quilts for anything but a simple edge-to-edge quilting. I also like to choose a backing fabric that is mid-toned, or is not one of the really light or really dark tones that are in the top. Again, this is just my preference. By this I mean, don't spend $100 on your fabrics, another 20 hours or more making your top, only to cheap out on the quilting. Before the top is quilted, it woud be valued at at least $400 (your time IS worth something, right??! ), so expect to pay between $150-250 to quilt it acceptably. Lovely quilting only enhances a carefully made quilt top. 99% of the quilts I receive to quilt for clients are without significant issues that would hinder acceptable quilting. Most, in fact, are really nicely made. 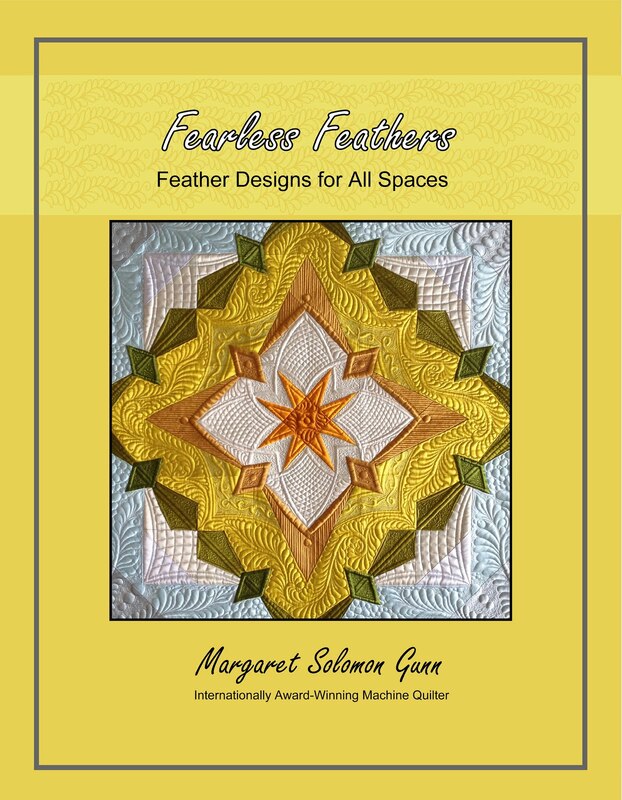 There are many less experienced piecers out there though that might benefit from my compilation of things that make quilting for others easier and more successful. These are only my thoughts. I welcome whatever you might like to add too. I hope you enjoy my sneak peeks of my next quilt. This is a first time client. She was a little nervous about leaving her quilt with someone new, needing to explain all of the previous quilters's inadequacies as she did. It kind of makes me nervous that someone would have such bad luck or maybe the bad luck is mine and she's just picky, who knows. This is a nice lap quilt that is beautifully pieced. I wasn't crazy about some of the fabrics initially, but it has certainly grown on me. It is a great example of how pretty a very simple quilting pattern can turn out. Sorry this is upside down! 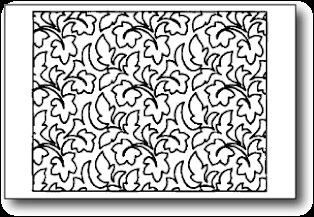 I did have fun choosing and combining florally and geometric designs. I love it when they are used together to help the eye to jump around. Too many feathers is just busy. You cannot see the beauty of each element if they all run together. 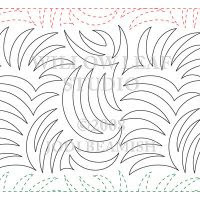 So I reserved feathers only for the outer white-ish border and the feathered heart blocks. The fabric of the setting triangles is busy and I thought it might be hard to see what I was doing so I just did the cross hatching. I love how the two narrow borders came out. I didn't want to break it up too much and use 2 separate patterns, so I designed it to work for both dissimilarly sized borders. I used a Hobbs 80/20 batting and Superior SoFine threas (ivory and sage green). 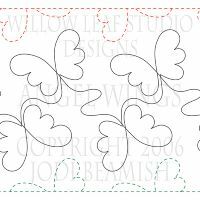 I designed the pattern for the pieced blocks so it could be stitched continuously. I might have done quilting in the creamy colored triangles, but it's a lap quilt and I just decided it had enough stitching. I have my quilt on the frame now (one with the grapes). With nearly 5 hours of stitching behind me, I can say that I have made a dent in it. It is rather small, only 42" square, so I don't think it is a quilt I will stitch on indefinitely. I hope to get it to a good point where it can come off the frame later this week, and move on to paying clients :-) It's fun to quilt for myself, but it does not pay the bills. 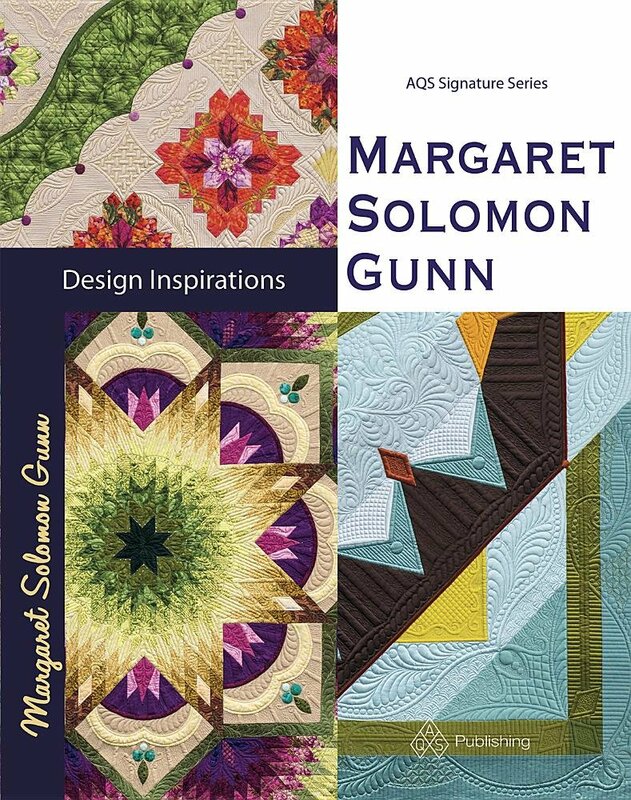 Ok, so my current copy of MQU arrived a day or so ago (which reminds me that a Dresden plate quilt in scrappy fabrics will go on my list of "Life's Makes" - love it!). Anyhow, what do I find on the 1st page of the magazine (behind the cover which is usually ripped half off! )...Yes, ME. I gotta say, I do not like my profile whatsoever. Noses should just be made petite for everyone. Oh well, this is not some fantabulous achievement here - just an advertisement that I stumbled into by my writing skills and love of quilting. Thanks Handi Quilter, the ad looks amazing! 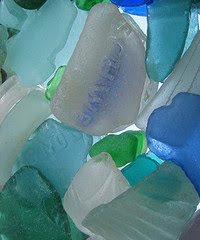 You guessed it - sea glass. I absolutely love the tones that this stuff comes in. Nature's perfect accident. I know it comes in other shades too like amber, brown and red, but what I am doing may well focus only on these blues & greens. Time will tell. Here's the beachy background that you have seen before (now, however, it is 99% pieced together and with it's borders!). Wow, batiks are just beautiful. I love them. I have made only about 25 of these - only another hundred or so to go! I bring the supplies when I go to Sophie's weekly appointments. So far, I like how this is going. I am going to try my hand at invisible machine applique. There are tutorials available for piped binding that are stitched all on the machine (which you all know is against my religion!). Here's one I came across a while ago. It looks nice, and I don't even think it involves cording! The Ricky Tims Grand Finale DVD also gives a good method for doing a piped binding via machine. Both of these methods look nice on the front, but since my quilt is headed to some judged shows, I really wanted to have a finished product that has as clean a backside as it does the frontside. I dislike when bindings are machine stitched down because they almost never look perfect on the back. My tutorial is not rocket science, but it did yield a nice finished binding on both sides. I'll warn you, though, my method does require hand stitching the binding to the back of the quilt (as you'd normally do), but to me that yields a prettier binding on the backside. 1. Some piping (equal to the perimeter of your quilt plus 4-6"). This is harder to find than you might think. 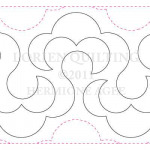 I used to buy micropiping at Joann's for when I make pretty smocked dresses, but was not able to find it. I ordered this from here. It is a perfect size. At 25 cents per yard, how can you go wrong. I have also heard you can use a thicker pearle cotton, though I have not tested this. 2. A cording foot. There are different types of these, but this is what I have and it works well. Cut the fabric that will cover the micro-cording 1.5" wide, and as long as the piping was cut to. Be sure to piece the sections together with a 45 degree bias cut, or else you will have too much bulk. Then press this in half. The micro-piping will slip neatly into the crease. Put a matching thread on top and bottom OR a water soluable thread (only if you plan to wash your quilt). Using your cording foot, stitch to the edge of the cording. I usually also secure the top end of the cording before I stitch so it cannot pull out. After you are done, you will very carefully need to trim the cording by placing your cutting ruler's 0.25" line on top of the seam, and rotary cutting off the excess. This takes a few minutes, but is necessary. Here's what you'll have a few minutes later. Unfortunately, you cannot start with piping the correct width because this is just too narrow to manupilate with the sewing machine and the cording foot. Susan Cleveland has a nifty piping cutting ruler that actually has a slot for the piping to ride into. But I am cheap, and opted to save my $$ for some other gadget. Everyone is trying to sell us something. Now, go to your regular sewing foot. Stitch the piping to the quilt's edge (Presumably you have already blocked your quilt at this point). The seam allowance may be set to 1/4" or you can just sew directly on top of the existing seam on the piping. Notice what I do at the corners. As I finish one seam, I back stitch a couple stitches. I then gently pull on the cording. I want to pull out about 1/4" of the cording to relieve the amount of bulk in the binding's corner. Do this on both ends. The next side of piping is started right at the end of the quilt (ie, do not do a folded corner as you'd do with your binding - the cording is stitched in 4 separate pieces). It is a little easier to remove the excess cording before you stitch the piping down. Next you need to cut your binding however you like. My binding is prepared on bias but either way will work fine. Again, make sure your binding strips are pieced together with 45 degree bias seams to reduce bulk. Listen carefully here. I cut my binding my usual 2-1/4" wide, pressed it in half, etc. Hindsight is 20-20. When I do this piped binding again, I will likely use 2-3/8" instead. Bear in mind that my quilt was quilted with 2 layers of batting, and is thicker than some. But mostly, with the piping, there is more bulk for the binding to have to go around. I did make my binding work with it 2-1/4", but it is a snug binding, and was not always pleasing to stitch it while it wanted to pop open. So, the last step is pretty much life as usual in terms of sewing on a binding. The only catch is that you have to be slow and careful, and plan to have to have areas that you go back and adjust to make the piping look pretty. Start midway along one side of your quilt. I set my seam to a little wider than 1/4" so that it covers the piping seam. On my machine, 1/4" is a setting of 5.3 and for the binding I used 4.7. It might be at most 1/16" inboard of the seam. It is enough that the threadline on the piping is concealed, and nothing but the tight little bump of the piping is visible. I do not pin my binding because there is enough bulk. I just stitch slowly and carefully. When you reach the corner, do as you usually do to get around the corner when applying continuous binding.... You are now all the way around your quilt, and the binding is sewn down to the top completely. Now take a careful look and see if there are any places that you need to go back and stitch closer to the piping or adjust. I won't lie, I spent nearly 3 hours putting the binding on (not the hand stitching!) this 75" square quilt. It will take some time. But the finished product will forever change how you do bindings. I promise. The above picture is before the binding is actually stitched to the back side. At this point, check and see how easily your binding is going to wrap the quilt's edge and comer the lines of stitching. If it looks close or that the binding will be very tight, then trim 1/16" or so off of the edge of the quilt, uniformly all the way around all 4 sides. Your binding should be "filled" but not so tight it takes jumbo clamps to hold it down in order to stitch. Here's my finished binding. I totally love the effect of the piping. For show quilts, this is a very classy edge, and it most definitely will help it to hang more straightly. 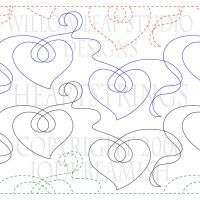 For any quilt, it is just a lovely way to infuse one more design detail into the finished quilt. Now, the quilt only needs a sleeve (ahh...150" more hand stitching!) and it is good to go!